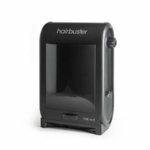 simply sweep hair or dust or debris up to the base of the unit, infrared sensors will detect the hair and activate the vaccum unit. This device works well on bare floor surfaces such as tiles, wood and vinyl. Dimensions width 34cm, depth 22cm, height 52cm.